off Clarence River, New Zealand coast, 11 April 1886. Thirty lives lost. "There is little doubt but that when she stranded she was lugging the shore too closely." The Taiaroa was of 438 gross register tonnage, 228 tons net register and was rather a pretty model of a medium sized vessel. She was built in 1875 at Glasgow by A. and J. Inglis for Messrs Patrick Henderson and Co. (Shaw-Savill and Albion Company), and was then sold to the Union Steam Shipping Company about 1877. Her engines were splendid ones, of 110-horse-power, 500 h.p indicated. Her length 189ft 3in; beam 23ft 2in, and depth of hold 12ft 6in. She left Glasgow on September 18, 1875; put into Hobart on December 3 to coal. On the evening of November 3, two days after leaving Capetown, Captain Robert Gilpin, who had been engaged in England to bring her out died while dining with his brother officers. The command then devolved on Chief-officer Joanness Spiegelthar. Early on the morning of December 10 she stranded on the Old Man Rocks, a quarter of a mile to the N.W. of Dog Island, the accident resulting from want of knowledge of this coast on part of Captain Spiegelthar. With the assistance of the s.s. Express she was towed off the same day without much damage and arrived at Port Chalmers on the 11th, being docked on the 17th. She came out to the order of the Albion Shipping Company. For a time she traded between Port Chalmers and Timaru under the agency of Mr Keith Ramsey and commanded by Captain James Stewart; and early in 1876 was purchased by the Union Steam Ship Company and kept the same trade under the command of Captain Petersen. Since then she has been mostly engaged in the coastal trade, but made one voyage to Fiji. From the Register of Australian and New Zealand Shipping she was classed L 100 A1; taken altogether she was the finest small craft in the Union Company's fleet, and was a great favourite with all coastal passengers. She is insured in the Dunedin office of the Union Company's insurance fund, but the vessel had been written off from time to time, and now stands at a moderate figure. She could carry 90, but had 20 passengers and 28 of a crew. Finding of Court of Inquiry : Master ought to have exercised greater caution. Certificate suspended for thirty days. Lyttelton. Arrived: April 4 - Taiaroa, s.s., 228 tons, Thompson, from Dunedin, via Timaru and Akaroa. Union Steamship Company, agents. Sailed from Lyttelton. April 5 - Taiaroa, s.s., 228 tons, Thompson, for Wellington and Nelson. Nelson. For Wellington - Dixon, Patching, Sergt. Johnston, Jones, Mr Odling. For Akaroa -Murray. For Melbourne - Gillon, Piper, Mrs Piper, Williams. For Sydney - Sharp. Wellington passengers disembarked before wreck. Departures: April 9th - Taiaroa, s.s. 228 tons, Thomson, for Nelson. Passengers - Mr and Mrs Taylor, Messrs Nicoll and McQuarters, and 1 steerage. Departures April 11 Taiaroa, ss, 228 tons, for South. passengers: - Cabin � Mrs FitzGerald, Messrs Ward, Gallbraith, Vallance, and Hawkins. Steerage -Sergeant Grant, Constable McQuarters and Mr Anderson. Wellington, April 12. The steamer Taiaroa, bound from Wellington to Lyttelton, went ashore yesterday. The vessel is on her beams end. Two passengers have been washed ashore, and it is believed that all other lives are lost. The Taiaroa left Wellington for Lyttelton at 11.35 a.m. on Saturday. The Penguin has been ordered to proceed from Wellington, and the Wanaka from Lyttelton. The Blenheim agent, Liggins, goes over land. Copy of Telegram from Blenheim to Union Company from Kekerangu. The Taiaroa had gone ashore at Trolove's, a gravelly beach, but free from rocks. "One of Kekerangu hands returning from Clarence reports that he met man on beach early this morning on north bank Clarence, who said he was passenger Taiaroa, which was ashore point about mile north Clarence river. He went down at once to wreck, and on their way met another passenger. Could see no one on board, and passengers saved knew of no others. (Signed) C.J. Liggins, Blenheim" Station hands have been sent north and south to search for bodies. Kekerangu is about 12 miles, and Flaxbourne about 25 miles, northward of the Clarence river. The Clarence river, enters the sea about midway between Cape Campbell and Kaikoura. Sergeant Grant is one of the passengers saved. The second passenger referred to in a telegram is Gilbert Hutton, Civil servant of Wellington. Hutton for nine years pilot-boatman at Lyttelton. The third survivor is Constable McQuartier, who stated there were twenty-nine in his boat, including the mate, stewardess, and five women. McQuartier was picked up on the beach four miles north of Kekerangu or sixteen miles north of the scene of the wreck. McQuartier drifted ashore in a boat this morning, on the beach between the River Ure and Flag Point, north of Kekerangu, in company with another man, who was quite dead. The boat turned over and righted itself several times after leaving the wreck, it being a cork lifeboat. There were eleven men in McQuartier boat when he left the wreck, but nine died of exhaustion before the boat righted itself the last time. The night was bitterly cold, dark, windy and wet, and nothing but the physical strength of McQuartier, who is a very powerful man, saved his life. At the inquiry McQuartier said I hold a second mate's certificate. I passed in Liverpool. He says the Taiaroa was going eight or ten knots when she struck. It was very wet and dark; blowing a gale, and heavy sea was on. He could just see the outline of the hills. The boats were attached by lines astern, as it was thought better to wait for daylight before trying to land, but they soon capsized in the heavy sea. A rocket was sent up and a blue light burned to show the position of the beach. After Grant swarm ashore he wandered eight miles northward along the beach, and finding no road or track went back again, ultimately reaching Woodbank station after going up Sandy Creek. Grant is a stiff built powerful man, and none the worse for his adventure. He recovered from the wreck today his own luggage, and the Government box containing the torpedo fittings. Sergeant Grant states - "Four boats started from the ship's side. I was in the starboard life boat. She swamped about twelve o'clock. The captain's boat broke adrift, and went to sea. Of the four boats, three capsized." Narrative of John MaQuarrie [McQuarters] [William Henry McQuartier] one of the saved. I am a native of Manchester, 32 years of age, and I came out to the colony as second mate of the ship Warwick, to Port Chalmers, two years ago. I was a steerage passenger by the Taiaroa, and was lying in my bunk about 7.30 p.m., when I felt the ship strike on the ground. I rushed out on deck, and found everyone making for the saloon for life-belts. The steward served out the life-belts as quickly as possible. The captain was on the bridge, cool and collected. Someone asked him where we were. he replied, "About fives miles from Kaikoura." [The captain swore at the official enquiry he said "Probably about twenty miles from Kaikoura. "][Log booked showed the vessel had travelled 63 miles] Great confusion took place on deck while the boats were being swung from the davits. I got into a boat on the star-board side, and in the same boat were four women (two passengers and two stewardesses) ; Mr Ward, the Whitehead torpedo instructor; Mr Grant, and also a "speiler" with curly hair, who greatly lamented having to leave his performing monkey. The women were all dressed with the exception of the youngest, a Salvation Army lass of about 25 years of age, who had nothing on but her chemise. The other three were elderly. All four women wore life-belts. It was quite light and cold. We could see hills, but no beach. A heavy sea capsized the boat after we attached it to the stern of the steamer by means of a line. The women kept well up for a long time, but one after another they there up their hand and sank from exhaustion, produced principally by the bitter cold. I and twelve others succeeded in getting into another boat which was floating keel uppermost. The boat righted itself. Had one broken oar. My companions seemed to be terribly distressed and exhausted, and when the boat turned over again five went under and never came up, leaving the second mate, five seaman and myself. The second mate said, just as day breaking "it's no good; I can't keep up any longer, " and by the time the boat grated on the boulders of the beach, and went ashore, he was also dead. (This body had �55 on him) I managed to crawl out of the boat and up the sandy bank towards the hills, and was making to Kekerangu station, when a man met me and took me in a trap to Kekerangu station. All the women behaved splendidly, and made no fuss. I believe all four were drowned close to the steamer itself. e & f. Two of the passengers saved in the captain's boat, Messrs Harper and Oliver, were Christchurch men. They are bricklayers by occupation, and were formerly employed at Mr Neighbour's brick and pottery works. Cargo: Only stray shipments picked up at Nelson and Wellington. The Taiaroa had on board the following cargo, taken in at Wellington:- 50 sacks barley, transhipped from Wanganui by Hogan and Co., 50 boxes soap, shipped by Kitchen and Sons; 2 cases by Thompson, Shannon and Co.; 1 case case an a quantity of cargo from Nelson. The Taiaroa was valued at about �15,000, but insurances are not known. There were eight bags of mail in the Taiaroa, six from Wellington and two from Nelson. Seven mailbags were recovered. The captain said after leaving Wellington at 11.30 a.m. on Sunday the Taiaroa had a strong N.W. wind to Cape Campbell. At three o'clock the wind chopped round suddenly, and blow hard from the S.E. with thick rainy weather and heavy fog. The captain was on deck till 6.30. The mate was on the watch on the bridge. About seven o'clock the mate came and told the captain he could see land on the port bow. The captain ran up immediately on the bridge. They were putting the helm hard a starboard. The captain stopped the vessel and then went full speed astern. She took the ground, and at the same time the chief engineer came and said it was of no use going any further astern, as she was making water. The captain gave orders to have the boats got out, and the passengers put into to them. All the boats were fast to the line over the stern except the captain's. The mate took charge of the first life boat. The second mate was in the last boat. After the vessel struck, the boats got away without difficulty, and every person was off the ship when the captain got into his boat. There was a heavy swell on the beach, and the weather experienced on the journey down to Wairau bar was very cold and rough. There were only three females on board. Two lady passengers and the stewardess were in No. 1 lifeboat. The following were also passengers:- James Ferguson, lately on a station at Taranaki, who was going to Timaru to visit his brother; and Smith and Harbord, two magsmen who had been attending the recent race meeting. 8. FERGUSON - 11 April, drowned on the Taiaroa, James, brother of Donald Ferguson. age 46. James was a shepherd from Murimutu, Hawkes Bay. 1. Amongst the passengers were Mrs Gerald FitzGerald, wife of the editor of the Timaru Herald, who was going down to join her husband. The cottage which had been furnished by Mr Fitzgerald in anticipation of his wife's arrival was named Tararua Cottage. Mr Fitzgerald has gone to the scene of the wreck. A gentleman well known in Wellington, Mr R.H. Vallance, the sportsman; and Instructor Ward, Sergeant Grant, and Gunner McQuartern, of the Torpedo Corps, who were on their way to Dunedin to bring up the torpedo boat lying there to Oamaru, in order that she might take part in the Easter maneuvers. April 14. Mr Gerald Fitzgerald of Blenheim searched the beach to-day for the body of his aunt. The captain sang out "all passengers get into the boats." The Taiaroa struck between 7 and 8 p.m. on Sunday evening. An attempt was made to get a line ashore, but failed. The boat I was in capsized and I was picked up by the boat Grant was in. This boat also capsized. All the crew and passengers had cork jackets on. The vessel is lying half a mile to the northward of Waipapa Point. Her bow is about fifty yards from the shore, and her broadside nearly parallel with the beach. She is heeled over a little to the port side. The sea is striking her with great force, but not breaking over the bridge or poop. Three bodies have been found about three miles northward of the wreck. Statement by Mr Trolove, owner of (Woodbank station) Kekerangu station:- "On the first news that there was a steamer ashore, myself, Mr T.W. Trolove, and the men, immediately proceeded down. We found the Taiaroa on the beach. Two of the survivors came up to the station at about 6 o'clock this morning, and told us about the accident. There names are, Sergeant Grant, A.C., and Gilbert Hutton, passengers. When we reached the beach, we hailed the steamer, but there was no one aboard. We then went along the beach, and picked up some bodies. There were all found about three miles to the northward. We then turned back. Some of the men are now searching the beach further northward." April 13. The steamer Penguin arrived at the wreck at seven this morning, and found the Wakatu and Wanaka, from Lyttelton, just arrived. The ship's papers and a few small things belonging to the passengers have been taken from the Taiaroa on to the Penguin. On the Wakatu were Mr Hugh Vallance from Rangiora, brother of Mr R.H. Vallance, and Mr W.S. Murray, who had a brother on board the Taiaroa. Captain Johnston of the Wanaka is very well acquainted with the locality, having traded for many years along that coast in the Grafton. The Penguin brought back the Taiaroa's papers and plate, and the Wanaka also brought up several articles taken from the wreck. No money or valuables were found on board except the captain's gold ring, which is in possession of Mr C.J. Liggins, the Union Company representative from Blenheim. The purser's books were found in splendid order. Liggins collected the silver out of the saloon and placed it with the ship's box from the purser's office on board the Wakatu for Wellington. The Clarence bridge men helped Liggins to board the vessel. Mr Piper, who, en route for Melbourne, was on board the Taiaroa between Nelson and Wellington, and arrived here, Lyttelton, per the Te Anau this morning, informs us that from the newspaper description he is able to identify the body of a man dressed in a brown suit, is that of a man named Murray. He was formerly a schoolmaster in Otago, in the Tapanui district and has been residing in Nelson for about a year. He was on his way to join his brother in Akaroa. This brother had lately arrived from England, and went northward per the Wanaka last night. The body of that passenger that was washed ashore had a leg bitten of by a shark. 13. Martin, a passenger, aged 40, and was supposed to be on his way home to Nairn, Scotland, where his relatives are tailors. Martin had also letters and discharges as a seaman and Government correspondence relating to a lighthouse appointment. Up to about a fortnight ago Martin was working at Flaxbourne station. Martin had an uncle named Thomson in Invercargill. Martin was a single man. His body was identified by John McNaught, shepherd, of Flaxbourne. The Taiaroa at low water at four this afternoon was within 10 yards of dry land. She seems to be lying steady, with small seas breaking over her, and leaning to seaward, in seven feet of water by the bows. Three men, working at Clarence bridge, swam on board this morning and rescued a monkey and a cat. They obtained dry clothes from the forecastle, and made two wraps fast from the forecastle, and made two wraps fast from the mast-head to the beach. The vessel seems to have her bottom stove in, but no holes are visible. The monkey and cat are now at Woodbank station. It is stated there was only one rocket fired. Had lights and rocket been used continuously, help would speedily have been obtained from workmen at Clarence River bridge, who saw the steamer's light, but took no further notice of it. Had the passengers and crew remained on board the steamer, there would apparently been no loss of life. April 13. Preparations are being made to inter the dead in the little Kekerangu cemetery, excepting the first mate, whose body will be buried in Blenheim . The Rev. Mr W. McAra from Kaikoura and Rev. T.S. Grace of Blenheim to conduct funerals. The chief officer's body was taken to Lyttelton by the Wakatu. He was identified by the steward. April 15. Timaru Herald. Mr Vallance's body will be taken from Flaxbourne to Blenheim and sent away in the Picton steamer to Lyttelton. April 17. Change of plan. Mr Vallance's body was buried at Flaxbourne yesterday. Mr Vallance's brother and Mr Mason, his late partner, were present. The Rev. T.S. Grace of Blenheim read the service. The s.s. Wakatu arrived from Kaikoura to Lyttelton on Friday 16th April bringing the bodies of Mr Monkman and Morrison. Funeral Obsequies. Dunedin April 18. The funeral of Chief Officer Monkman and Mr Morrison, late a fireman of the Taiaroa, which took place to-day, were very largely attended, the Druids (200), of which Morrison was a member, mustering strongly. Mr Morrison has a wife and one child living in Dunedin. His wife is at the present time, we understand, in a rather critical condition. Mr Monkman was a nephew of Mr H.B. Monkmon, of the Union Company of Dunedin. The bodies were conveyed to Dunedin in the steamer Omapere on Saturday, and the joint funeral took place on Sunday afternoon. Some thousands of people assembled to witness the procession starting from the Rattray street wharf at 3 o'clock, and the streets were all along the line of the route thronged with spectators. A great crowd of people had also assembled in the cemetery, and when the cortege arrived there must have been between 7000 and 80000 people present. The coffins were borne to the graves by seamen in uniform of the Union Steam Ship Company, the coffins being covered with wreaths and bouquets. April 16. The coroner issued certificates for the burial of five bodies at Kekerangu, the three at Woodbank and one at Flaxbourne. Four passengers were women, and sixteen were men, besides one child. The Taiaroa carried a stewardess. Sad Loss of Life. Those on board numbers 48, being 20 passengers and 27 of a crew. The number saved was 14, thus leaving 33 drowned. 25 bodies unaccounted for as of April 14. The spelling of the names differs in The Star and Timaru Herald, newspapers. 36 Otago Witness Friday April 30 1886 page 18.The Timaru Herald learns that Mr Edwards, late of Ashburton, and late a partner with Mr Lee, of the Crown Hotel, Temuka, was a passenger by the ill-fated Taiaroa. He went aboard at Wellington, and we are sorry to say he drowned. His name did not appear in the published list, as he did not take out a ticket previous to going on the vessel. d. Mr John Harper, of Christchurch, who was saved, is well known in the North Canterbury district, having for many years been a coach-driver on the Ferry Road. Among the sufferers by the Taiaroa disaster, is Mr G.G. Fitzgerald, Editor of this journal, whose wife perished in the wreck. The deceased lady was on her way from Wellington to join her husband in this town, with every expectation of resuming the domestic happiness which characterised their past married life. Mr Fitzgerald, in anticipation of his wife's arrival, furnished a comfortable cottage, and made other preparations for her reception. The dwelling bearing the designation of Tararua Cottage and in furnishing it Mr Fitzgerald called to recollection the heart-rending calamity caused by the wreck of that steamer five years ago, and cherished a hope that no such disaster would occur to his wife. It was, however, a transitory hope, and when the telegrams announcing the wreck and the loss of his beloved partner came to hand, the shock was all but unbearable, as may well be conceived. Mrs Fitgerald was a most estimable lady, and highly esteemed by all who had the pleasure of her acquaintance, and these were many. The whole of her luggage having been lost, her husband possess no memento of hers, with the exception of two letters lately received from Wellington, and this circumstance, of itself, intensifies his grief. He left yesterday by the Express to Lyttelton, and sailed last evening in the Rotorua for wellington, for the purpose of proceeding to the scene of the disaster, in the hope that the body may be recovered. If, it should, it is his intention to bury it in Wellington. His nephew, Mr Fitzgerald, son of the Comptrollor-General of Accounts, proceeded to the Kaikouras yesterday, and will meet his uncle there. The cat saved from the wreck was a pet of Mrs Fitzgerald's, and will be restored to her husband. There being no issue to the marriage, the deceased lady left no family to mourn her loss. We need scarcely add that we strongly sympathise with the bereaved gentleman, and trust to see him back soon to resume his editorial functions. Among the relics of the wreck lying at the Clarence river is a green box containing a performing racecourse monkey. The box has "I. Harboard" painted on it. The monkey and the cat are at Woodbank station. Her deck-houses are very little damaged, but there, appear to be several holes in her bottom. All the charts and papers have been recovered and taken on board the Penguin. Several articles belonging to passengers have also been recovered. Amongst these is a lady's handbag containing two handkerchiefs marked "Jane Fitzgerald." 26. Robert Irvine, fireman, about forty-five years of age, belonging to Newry, Ireland. Body identified. He had been in the Taiaroa fourteen months, and was single. Death. McDonagh - On the 11th April, drowned at wreck of s.s. Taiaroa, George McDonagh; aged 23 years. Deeply regretted. Death. On the 11th April 1886, drowned from the s.s. Taiaroa, William Harris Kellan (born at Oamaru): aged 21 years. 16. On James Powell was found a second mate's certificate, a gold watch and chain and a locket. There was a gold ring on his finger; �3 14s 2d in cash; a sliver locket with the monogram "J.P." and a note-book containing a letter to deceased from his brother. Powell had a brother who left on the last trip of the Aorangi. The Star April 8th 1886 - The Aorangi's Passenger List - From Wellington to London. 18. Mr Spooner, who is well known in Dunedin, is the son of an old resident of Otago. Purser. He is a son of Mr G. Spooner, who for many years a resident of Milton, and is now working at Table Hill. April 19th. A considerable quantity of passenger's luggage has been recovered from the hold of the Taiaroa and sent away in the Wakatu, amongst which was Mrs Fitzgerald's bag containing personal trinkets and effects. Yesterday a gang of men were put on board by the Union Company, and got out more luggage. Wellington 19th. The Taiaroa's cargo was sold this afternoon to Watson and Mackenzie for �30. April 14. Timaru Herald. Captain Thomson has been presented with a valuable gold locket by occupants of the rescued boat. The Taiaroa Enquiry. Finding of the Court. The Captain's certificate cancelled. Before Mr Stratford, R.M. and Captain Morris, Nautical Assessor. Mr Stratford found that the vessel was navigated safely up to 3.30 pm when the wind changed to the southward. The course ought then to have been altered. The ship being light. He should have allowed at least a point, and moreover, knowing he was on a lee shore, with the wind and sea increasing, a leadsman should have been placed in the chins till the weather cleared. Had this been done at 6 or 6 .30 the soundings must have shown him he was too close inshore. The neglect of Captain Thomson to look at the compass shows want of care, and ignorance of the responsibilities of his position. His certificate would be cancelled. ; but, in view of the judgment, coolness, and courage displayed after the wreck, the Governor would be recommended to be reissue his certificate, providing he shall have served in the meantime regularly at sea as mate. The costs of the enquiry amounted to 33 6s of which 16 and 10 would be charged against the captain. Up to the time of writing there are no tidings of further discovery of bodies. It is thought likely that many are buried in the sand. Mr Gerald Fitzgerald came along from Flaxbourne beach to-day, but found nothing except the Taiaroa's signal rack with one flag. He reports that the beach has been searched as far North as Cape without success. The passengers' luggage is floating out of the holds of the steamer, but a bag bearing Mrs Fitzgerald's name, a box with [ "Miss Smith, passenger per Orient," and a Hallelujah bonnet of the Salvation Army lass are about all that has been recovered. Timaru Herald, Monday April 19 1886 The Official Enquiry began April 17 in Wellington. To be resumed May 3. Still continuing on the 12th May. The Star April 13 1886. An inquest will be held. Capt. Williams surveyed the wreck this morning, on behalf of the Union Company and decided to abandon the vessel to the underwriters. It is a curious coincidence that the names of most of the vessels lost by the Union Company commenced with the same letter "T," as witness the Taranaki, Taupo, Tararua, and Taiaroa. It is worth while noting the loss of the Taiaroa, has occurred in the same month, April, as that of the Tararua, five years ago. 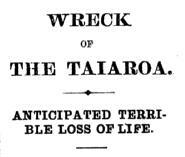 Oddly enough too, the scene of the disaster bears the same name as that of the catastrophe of 1881 - Waipapa Point. The word "Waipapa" means "smooth" or flat water. The name was applied in general to a place where canoes could run up on the shore to land.